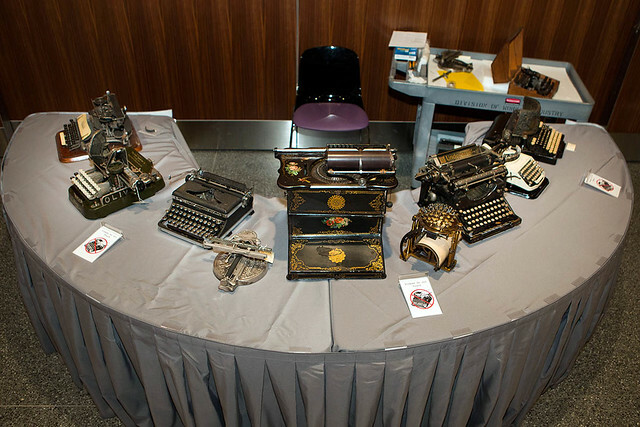 The sound of clicking typewriter keys filled the museum's Innovation Wing recently during Type-O-Rama. This event, presented by the Patrick F. Taylor Foundation Object Project team, featured typewriters from the permanent collections and gave visitors a chance to try their hands at typing on models from the teaching collection. The poets from Typewriter Rodeo brought their vintage machines along to compose free poems on any topic—even an ode to typewriters themselves! The Taylor Foundation Object Project explores how objects we use in daily life grew out of groundbreaking innovations, and typewriters are one example of these "everyday things that changed everything." At Type-O-Rama, seeing machines that were used in American history and tapping away on devices from different eras got us thinking about what we can learn about innovation through typewriters. Why revisit typewriter innovations today? When you look at a computer or cell phone today, you can see evidence of the typewriter. It was used for many of the same purposes as today’s devices, like office work, personal correspondence, and creative expression. Controlled by physical touch, typewriters allowed users to stamp ink letters directly on paper with the press of a key. Visitors to Type-O-Rama got firsthand experience with Taylor Foundation Object Project teaching collection objects, including a 1920s manual Royal typewriter and a 1950s electric IBM typewriter. Many of our younger visitors had never seen a typewriter in person or touched one before encountering our teaching collection machines. These authentic objects are intended for close-up examination and handling, unlike ones in the museum's permanent collection. How have typewriters changed over time? At Type-O-Rama, curator Susan Tolbert shared typewriters from the Work and Industry collection that illustrated a variety of changes and innovations in these devices from different eras. Mark Twain, an early adopter of the Remington, called it a "new fangled writing machine." The Remington's QWERTY keyboard, developed by Christopher Latham Sholes and Carlos S. Glidden, was specifically designed to slow typing speeds in order to lessen the chances that machines would jam. Jamming could occur when the mechanical type bars, which were operated by the keys and arranged in a semicircle, clashed against each other. Most computer keyboards today still use the QWERTY layout, even though there's no longer a mechanical reason to do so. The Blickensderfer No. 5 typewriter has a "scientific" rather than a QWERTY keyboard, with the most commonly used letters on the bottom row to reduce hand movement. It also has a patented "type wheel" that contains all the characters and different type fonts. The wheel would rotate to strike the paper and create a typed mark, a method that minimized jamming. What can typewriters reveal about the people who used them? Typewriters provide a way to explore technological innovations as well as the stories of the people who used them. Curator Stacey Kluck shared a few objects from the Culture and the Arts collection that were used by notable people. Beginning in the 1930s, Mildred Wirt Benson, also known as Carolyn Keene, used this Underwood Model 5 typewriter to write several Nancy Drew mysteries. The faded keys show its regular use, and the worn spot on the right side of the space bar reveals that Benson was probably right-handed. While Benson's machine has a unique connection to her life and beloved book series, the Underwood Model 5 was a ubiquitous device. The first widely popular workplace typewriter, it was used by many different people in a variety of jobs and contexts. Shirley Temple used this Bing typewriter, branded as an Anfoe Student Model, in the late 1930s, when she was around 10 years old. Made by a German toy company, student models like the Anfoe were lightweight and small in size to be practical for children to use. How did users' needs drive typewriter innovations? This 1872 Hansen Writing Ball probably doesn't strike you as a classic typewriter in appearance, but the Danish-made writing ball was considered an engineering feat. Rasmus Malling-Hansen, an educator and the inventor of the writing ball, created a Braille model of the writing ball that users who were blind or had low vision could operate independently. The most famous writing ball owner was philosopher Friedrich Nietzsche, who sought a typewriter that he could use as his vision declined. Alfred Ely Beach received a patent in 1856 for an "Improvement in Printing Instruments for the Blind." Instead of making ink marks, his typewriter imprinted raised letters on paper for reading by touch. Typewriters have been used by many different people, for different purposes. We think this poem by Typewriter Rodeo poet Sean, "The Tip of History," articulates what makes typewriters so fascinating: their look and feel, how they've evolved over time, and how people have used them as a tool for work, communication, and creativity. Caitlin Kearney is a new media assistant for the Taylor Foundation Object Project. Previously, she has blogged about exploring historical innovations through a classic American game show.